Antibodies are immunoglobulin (Ig) molecules made up of 2 large heavy chains (~55 kDa each) and 2 small light chains (~25 kDa each). Heavy chains are bound to light chains by sulfhydryl linkages to form a Y shaped structure. The stem of the Y contains the constant region (Fc) and the two prongs of the Y contain the variable region (Fab). The Fab interacts with the antigen and therefore is unique to each antibody, while the Fc is common to all antibodies and interacts with the immune system. The Fc portion of the heavy chains defines the class of antibody, of which there are five in mammals: IgG, IgA, IgM, IgD and IgE. The classes differ in their biological properties, otherwise known as effector functions, and their functional localization to ensure an appropriate immune response for a given antigen. IgG is the most abundant circulating antibody, making up 80% of the total antibodies and 75% of that found in serum. IgG provides the majority of antibody-based immunity against pathogens. IgG can be split into 4 sub-isotypes, each with its own effector function. IgA is a dimeric antibody present in mucosal secretions in the respiratory, gastrointestinal and urogenital tracts, in saliva, tears, sweat, milk as well as in serum. IgA protects mucosal surfaces by neutralizing bacterial toxins and inhibiting adhesion to epithelial cells. IgA can be split into 2 sub-isotypes. 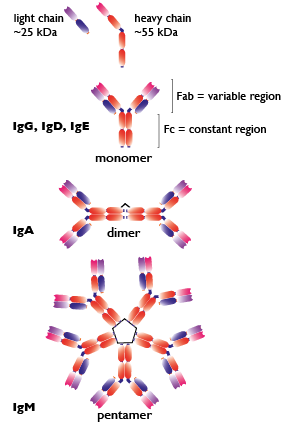 IgM is the largest antibody, with five Y structures being joined by their Fc regions in a circular configuration. IgM is expressed on the surface of B cells and present in serum, making up about 10 % of antibodies in the blood. IgD is monovalent and found on the surface of B-lymphocytes and together with monomeric IgM, serves as antigen receptor for the activation of B cells. IgE is a monomeric antibody that accounts for only 0.002 % of the total serum antibodies. IgE is bound to tissue cells, especially mast cells and associated with allergic reactions. During antibody switching, the Fc portion of the antibody heavy chain is changed from one isotype or class to another. Since the Fab region, and therefore antigen specificity, remains the same, the switch in isotype permits a change in the ability of the antibody to interact with different effector molecules of the immune system. Class switch recombination is a biological mechanism that occurs in activated B cells, triggered by cytokines.The isotype generated depends on which cytokines are present in the B cell environment. Class switching may reduce or potentiate effector functions, which include the complement-dependent cytotoxicity (CDC), antibody-dependent cellular cytotoxicity (ADCC) and antibody-dependent cell phagocytosis (ADCP).